Bus Line - 73 Bus to Waverly St.
Savinos Grill, located in Belmont, Massachusetts, invites you to join us for an evening of elegant dining in a beautiful setting. Our unique offerings combine the flavors of the foods of Italy and the surrounding Mediterranean regions. We carry a diverse selection of international and domestic wines as well as fine liquors. Chef Tom Cutrone opened Savinos in April 2007 in Belmont's Cushing Square. The decor is warm shades of the Tuscan countryside with an edge of upscale city design to complement the dining experience. 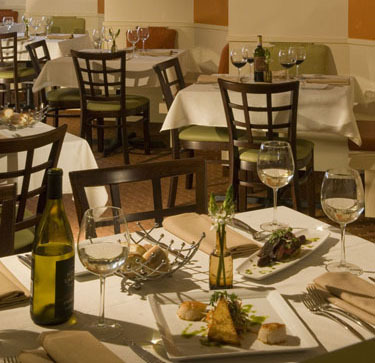 Savinos cuisine features creative seasonal pairings of fresh, local and imported foods. The contemporary menu highlights the foods of Italy and the surrounding Mediterranean regions. The wine list enhances the menu with European wines as well as domestic selections. The restaurant also hosts dinners with wine speakers for an informative and enjoyable dining experience. Tom Cutrone has been a chef for over 25 years since he graduated from the Culinary Institute of America. He moved from New York to Boston and has worked in restaurants such as Le Bocage, Tuscan Grill and L'Espalier.